Please read the Admissions Policy and Guidelines for entry to the Nursery year at HJPS in September 2019, which are available for download below. Please note that a place in Nursery does not give application priority for future Reception entry. 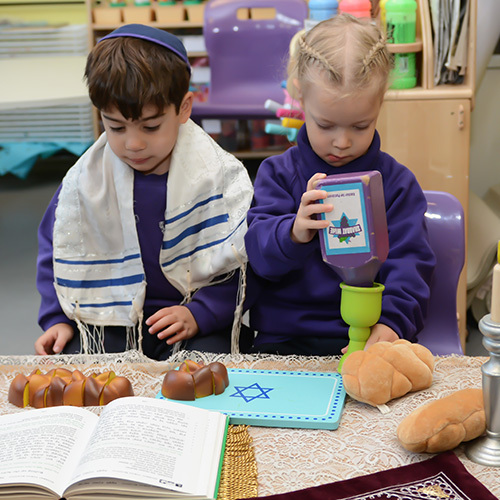 The Nursery Admissions Policy states that for those who wish to be considered as priority applicants, the Certificate of Religious Practice for primary schools under the religious authority of the Chief Rabbi (the “CRP”) is to be completed and sent to the school by 15 January 2019. The Nursery application form, available for download below, is to be received by 15 January 2019. There is no registration required with Hertfordshire County Council. Please ensure a photocopy of all documents are kept for your own records. The CRP is valid for applications to all United Synagogue primary schools and can be used for entry to Reception 2020. Parents should register with synagogues for this process and liaise with them directly.